The city of Austin is known as the “live music capital of the world” and is often mentioned in lists like this for a number of other reasons as well. For starters, the city has an unemployment rate that is much lower than the national average, so jobs are plentiful. Also, they have no state income tax, 8 different colleges/universities to choose from, a track record of having some of the cleanest water, and an abundance of natural scenery surrounding the city. There are also a number of luxury subdivisions like Avana, Meridian, Rim Rock and Muirfield, offering great deals on brand new houses in the South Mopac area. Situated just outside of downtown Denver, Boulder is known for its natural beauty, providing a perfect environment for outdoor activities like camping, skiing, biking, and hiking. This city is also ranked as the 17th greenest city in the U.S., with a population that consists mostly of 30+ singles that enjoy living eco-friendly lifestyles. 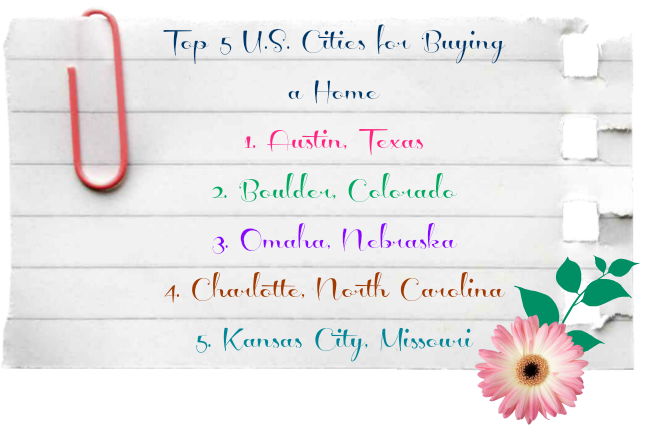 However, be aware that a move to Boulder won't come cheap, as the average home cost there is almost 40% higher than the national house price average. Many people have begun flocking to Omaha for jobs, being that the city's unemployment is an impressive 4.7% while the average cost of rent is only about $716, which is more than 10% lower than the national average. The city also experiences sunny weather for most of the year, and the local economy is booming with new restaurants, art galleries, nightclubs, and other shops and entertainment venues. This city has seen significant growth since 2000, with the addition of its own professional football and basketball teams, and being home to the financial headquarters of a number of large companies like Bank of America, Family Dollar, and Lowe's. In addition to great weather for most of the year, the city's residents enjoy low property taxes and utility rates, as well as a low average home cost of only $175,000. Aside from the fact that Google has installed ultra-high-speed internet for the entire city [although it will no longer be free], KC also offers the advantages of having a low cost of living, with food prices that are below the national average, an average monthly rent cost of $725, and average home price of $162,000. In closing, here’s an important piece of advice - never purchase a home in an area you've never visited in person. Statistics can only tell you so much about the actual character and feel of a place. Thus, the only way to know for sure that you'll be satisfied with your relocation is to take the time to visit each of the cities you're considering before making a buying decision.